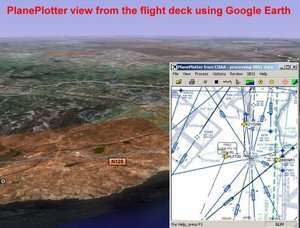 PlanePlotter by COAA is an aircraft tracking program which gives you a radar-like display of aircraft around your position which are transmitting ACARS, ADS-B and HFDL. This program is absolutely packed with some really cool features. One of our favourites was the integration with Google Earth. Another very cool feature was listening in to air traffic control radio and following what flights were up to. For security reasons, you should also check out the PlanePlotter download at LO4D.com which includes virus and malware tests. Additional screenshots of this application download may be available, too. This title has been tested as Clean by staff. PlanePlotter has a presence on social networks.